Dipl.-Ing. 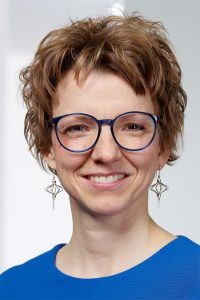 Katja Elschner M.A. (38) studied Engineering of Traffic and Transportation at Dresden University of Technology and specialized in Electric Railway Systems. Since 2007 she is with Siemens AG as System Engineer and Technical Manager for international AC and DC railway electrification projects. In 2015 she graduated from European University Viadrina Frankfurt (Oder) in Mediation and Conflict Management. She is heading the department “System Engineering & Integration” within Rail Electrification [RE] since 2015. In 2018 she became head of “Engineering”. One of her main responsibility is to support and drive innovations in the area of digitalization within RE and Mobility. Ms. Elschner is a team player and she can rely on a great, innovative, agile and multicultural team in Mobilty. Railway operators need to be flexible to react on incidents like break downs, increased operational needs and service scheduling. Digital solutions enable customers to take the right decision based on transparency status, on available energy and on prediction of the conditions for the next ours. The speech will introduce digital solutions enabling operators to provide reliable operation. Digital twins and decision support tools delivering RT-based predictions are taken into consideration as well as smart phone apps providing information to operators. The world of digital solutions cover a huge spectrum - from expensive to cost-effective innovation, from long-term to short-term development and from complete new techniques to digitalization of the existing. For all of them the goal is clear: Operators shall be able to get their jobs done with minimum risk and highest productivity.